The first batch, made with rice flour and cornstarch, tasted like packing material. Another early attempt came out heavy enough to fling at a burglar’s head. Garbanzo bean flour may have the necessary protein to replace the protein lost with gluten, but cookies made with it taste like falafel larded with chocolate chips. No thanks. I started using amaranth flour instead, as it has ample protein but doesn’t taste like beans. Sorghum flour has the texture of whole-wheat flour and lent the dough some heft, while tapioca and potato starch offset its heaviness. This time, we didn’t forget to add the xanthan gum. After all this, the thought of baking with all-purpose flour actually seemed pretty boring to me. As I tried different flours and varying methods, Lucy learned to roll over and pull herself up to stand. She was nearly ready to wait expectantly at the kitchen counter by the time the batch came out of the oven. They were warm, disappeared quickly, and inspired companionable silence. I didn’t care if these cookies weren’t exactly the same as what I’d grown up with. Everyone in the room agreed: these cookies—these gluten-free cookies—were the best chocolate chip cookies any of us had ever eaten. Ever. This is no longer David’s recipe. It’s my chocolate chip cookie recipe now, the one I bake with Lucy. She and I stand side by side while we make them. As I turn toward the cupboard to grab the flours, I see her stretch her arm toward the bowl of chocolate chips for another taste. “Hey Boo,” I call out, and she draws back her hand, smiling. She’s not even two. She’s still listening to me. This recipe, which originally appeared on Shauna’s blog, inspired no fewer than 92 comments at last count. Suffice it to say, there were a lot of deliriously happy home bakers in the days after this recipe first went public–and there are even more today. 1. Sift each of the flours into a bowl. Add the xanthan gum, baking soda, baking powder, and salt and stir well. I like to use a whisk to sift the flours. 2. Place the butter and the sugars in the bowl of a stand mixer and, using the paddle attachment, mix them until they’re just combined, then mix for 1 minute more. Don’t overmix, however, as this could result in spreading during baking. Add the eggs, 1 at a time, making sure each is fully incorporated before adding the next. Add the vanilla extract and mix. 3. Add the flour mixture into the batter, 1/2 cup at a time, mix just until the dry ingredients have been incorporated before adding the next addition. Add the chocolate and mix just for a moment. No broken chocolate here. 4. Cover the dough with plastic wrap and refrigerate. You might want to shove it to the back of the fridge and arrange even more enticing foods in front of it, because you shouldn’t touch the dough for 36 hours. Really. 5. When it’s time to bake, pull the dough from the refrigerator and preheat the oven to 350°F (175° C). Line a baking sheet with parchment paper or a non-stick baking mat. 6. Scoop generous balls of dough from the bowl. You can determine the size for yourself. If you want them to mimic the indulgently sized cookies found in pastry shops, the dough should be the size of golf balls. You could instead weigh them so the dough balls are 3 1/2 ounces each. Mine were the size of the indentation of the palm of my hand, but I could still lightly wrap my fingers around the ball. Place 6 of them on the baking sheet. Poke any errant pieces of chocolate back into the dough. Sprinkle the top of each cookie with the sea salt. 7. Bake the cookies about 18 minutes, less if you make smaller cookies, or until the tops have turned golden brown. The middles should still be somewhat soft. Take the baking sheet out of the oven. Allow the cookies to rest on the baking sheet for 10 minutes. Transfer the cooling cookies onto a cooling rack and allow them to cool for a few more moments. 8. 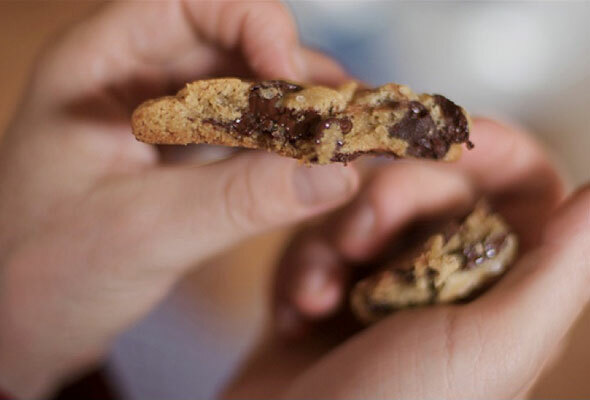 Eat warm chocolate chip cookies and feel grateful. Why not? I’d already made these once before our official testing, and was delighted to have another excuse to make them. I only can say that these are amazing chocolate chip cookies. They’re soft in the middle, slightly crispy on the outside (they soften up after a day or so, though), with just a wonderful moist, yet slightly dense, texture. I love these. I used granulated cane juice, light brown sugar, and a different brand of semisweet chocolate chips, as I can’t find Dagoba. It’s problematic for me to have these sit for three days, though—I can’t seem to leave the batter alone. This recipe rules and is my definite favorite chocolate chip cookie recipe. The combination of the flours and starches gives excellent results. Sometimes the proper ratios in gluten-free recipes are tricky. In this recipe, all the work is done for me! My non-celiac husband adores these cookies and prefers them to gluten cookies I’ve made in the past. I hate to admit this, but even the raw dough is great! The texture is so lovely and soft, yet chewy. These cookies make me smile. They are simply delicious. Gluten-Free Chocolate Chip Cookie Recipe © 2010 Shauna James Ahern. Photo © 2010 Shauna James Ahern. All rights reserved. All recipes and photos used with permission of the publisher. Shauna’s adaptation liberated me! I’ve made these cookies so many times, and if I don’t tell, no one knows they’re eating GF. Thank you so much for sharing this. I have a friend who is in your same situation and I have been trying to find a yummy recipe to make for her as a surprise. This will definitely fit the bill! Thanks again! Can’t wait to try these out—I’ve been reluctantly gluten and (mostly) dairy-free for more than three years and of course my favorite foods are bread, cheese, ice cream, and my *killer* chocolate-chip cookies, which I still bake for my kids. Maybe these will be the *new killer* chocolate chip cookies—ones I can actually eat! Xanthum gum has always been hard to find. I haven’t looked in a while. Our new supermarket has a lot of gluten-free products now—it has a whole section for GF folks. I don’t remember seeing sorghum flour there. I wonder if they have it. When I was low-carbbing it, I would’ve loved to make this. Now I am trying to eat less gluten as diabetes runs in my family, altho’ I don’t have it. Thanks for all your testing and creating. I can’t wait to get all the ingredients and get baking. Super yummy recipe! I can’t wait to try it! It sounded so good I went ahead and shared it on my food blog! Yum! David Leite’s recipe wasn’t my favorite chocolate chip cookie recipe before I had to give up wheat but it was my family’s favorite so I made them frequently. I was so glad to find someone had adapted it to be gluten free and it was with high hopes that my family and I watched these bake. My family loves them. I’m the only one who notices the flavor of the amaranth although to be fair, I don’t know if I would notice it if I didn’t know it was in there. Ultimately, they’re very good and certainly worth making whenever the urge for a yummy, decadent cookie hits. Hi Wendi, I’m happy that you found a version of the cookies that works for you and your family. We all were very impressed with Shauna’s results. Munch on!